The MLLP was represented by its members Jorge Civera and Gonçal Garcés at the Translating Europe Forum 2015 conference, which took place in Brussels on 29 and 30 October, organized by the European Commission’s Directorate-General for Translation. Read here more about the event, and watch how we participated in the debate. Organized by the European Commission’s Directorate-General for Translation on 29 and 30 October, the Translating Europe Forum 2015 conference has been this years’ central event in their Translating Europe series of meetings around the EU, with the goal of encouraging more systematic cooperation between all stakeholders in the world of translation and interpreting. With an attendance of around 500 people, including students, researchers, professionals, and policy makers, the conference has been an excellent meeting point for the exchange of ideas and networking. MLLP members Jorge Civera and Gonçal Garcés were there to be in touch with some of the most active users of the language technologies that we research and develop. The conference’s programme, which had a special focus on the interests of advanced students and young professionals, covered a wide range of current topics, from “The role of translation for multilingualism” to “Translation platforms and tools in the digital age”. The organizers have made available on the conference’s website the full recordings of all the conference’s sessions (available in English, French and German thanks to the work of the EC’s interpreters), as well as the slides files that the presenters used (and also a photo album of the conference). While language technologies were not the main focus of any specific session, their widespread use and current advances made them a pervasive topic all along the conference. In particular, during the session “The role of translation for multilingualism”, Panagiotis Alevantis of the European Commission reminded the attendants of how the EC considers that language technologies are going to have more and more of an essential role in the field of translation, and is pushing through policies for their development, and leading by example by pioneering their application in their own internal services (as demonstrated by their internally developed MT@EC machine translation systems). Mr Alevantis’ comments can be heard in the video of the session (from 18:00 to 22:30). After Mr Alevantis’ comments, the MLLP participated in the session’s open discussion in order to express our opinion that language technologies, with the most recent advances in the area (including in speech recognition and machine translation, two of the MLLP’s fields of expertise), are at a point in which they can be more useful than ever. This sparked a short debate on the topic until the end of the session, with the participation of all of the session’s speakers. You can watch this debate on language technologies in the video of the session, starting from 39:40 (again, available in English, French and German). For more details, we have compiled a timed summary of the debate. We at the MLLP are very glad to have had the occasion to be at the Translating Europe Forum 2015, which has led us to meeting researchers and professionals in the field of translation that have all shown great interest in the latest developments in language technologies. We’d like to congratulate the EC’s Directorate-General for Translation for the organization of the event. We look forward to future editions of Translating Europe, where we are sure there will always be a space (even dedicated sessions) for language technologies, about which there is much to debate between researchers, developers and users. 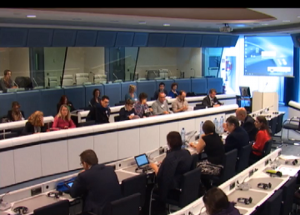 Posted in All, Events, Videos and tagged #TranslatingEurope, Conferences, Language Technologies, Translating Europe Forum 2015.